Charles IX had tried to reconcile the two religious parties, but when this failed, he was driven by the Guise family to authorize the Catholics to assassinate the Protestant leaders; the situation degenerated into a massive massacre. The treaty of Saint-Germain in 1570 was a new attempt towards civil peace and brought the third war of religion to an end. However, it aroused the anger of the ultra Catholics who – led by the Guise family – esteemed it to be too favourable to Protestants. The queen mother Catherine de Medici, hoping to establish national reconciliation for good, helped to bring about the marriage of Henri of Navarre, the future Henri IV, a protestant, to Marguerite de Valois, sister of Charles IX. Numerous protestant noblemen from the king of Navarre’s retinue came to Paris for the wedding, which took place on 18th August. The leader of the protestant party, Admiral de Coligny, a favourite of the king, urged him to take part in the war that was taking place in the Low Countries (or Flanders). His idea was for France to join forces with the prince of Orange and to support those who had risen up against Philip II of Spain. He was convinced that a war against Spain would be the best way of reconciling Catholics and Protestants, united against a common adversary. On 22nd August, an attempt was made upon the life of Admiral de Coligny as he was coming out of the king’s council at the Louvre palace. The attempt failed but the admiral was wounded. This was probably the work of the Guise family, who were very much opposed to the Flanders war ; and Spain may have taken in the plot. Saint Bartholomew's day massacre in Paris (1572) by François Dubois © S.H.P.F. People were stunned by the news and the atmosphere in Paris was explosive. During the night of the 23rd August, a royal council was held, at which the decision was taken to assassinate Admiral de Coligny and a certain number of Huguenot leaders. The bells of Saint-Germain-l’Auxerrois sounded the alarm. The admiral was savagely killed in his home and his body thrown out of the window. Many Huguenot noblemen were massacred in the Louvre palace or in the streets of the capital; caught unawares at night, they were unable to defend themselves – as Théodore de Bèze wrote, they were killed “like sheep at the slaughterhouse”. Saint Bartholomew's day-August, 24,1572 © S.H.P.F. 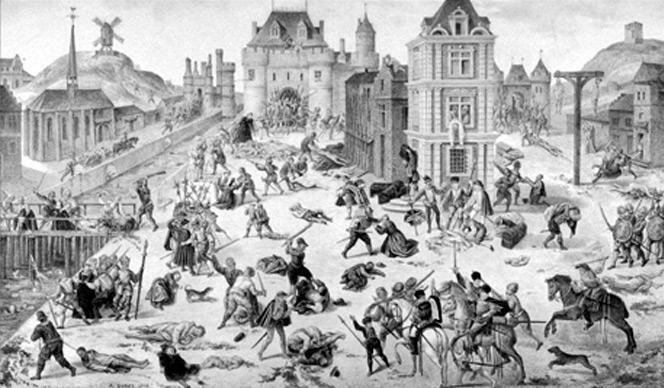 The massacre continued for three days throughout Paris – but the king was unable to control the situation. Violence was at its peak. The Catholics, recognized by the white cross they wore on their hats, attacked all the Protestants’ houses. The streets were red with blood. The number of victims was estimated at about 4.000 in Paris. On 26th August the king stood up in Parliament and claimed responsibility for the massacre. 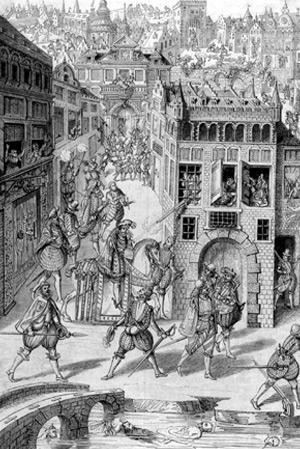 As the news spread, violence broke out throughout the provinces as well; local St. Bartholomew massacres took place from August to September 1572 in La Charité, Meaux, Orléans, Lyon, and other towns. In all, at least 10.000 people were killed in the provinces. Pope Gregory XIII greeted the news with enthusiasm: he ordered masses of thanksgiving to be held and had a special medal made to commemorate the event. The massacre of St. Bartholomew was the most tragic event in the wars of religion and can be remembered as sparking off the fourth of the wars between the Catholics and Protestants.